Baking bread is almost like a form of chemistry—it requires specific ingredients, exact amounts, and everything needs to be mixed in just the right way. 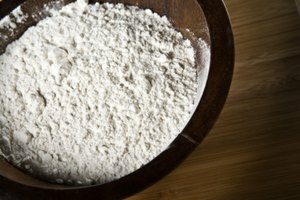 Many recipes call for bread flour, but not everyone keeps this ingredient stocked in the pantry. Luckily, you can transform all-purpose flour into a pseudo bread flour. 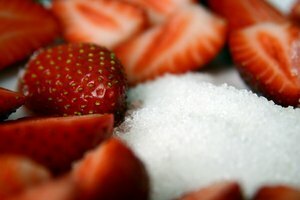 For every cup of bread flour called for in the recipe, substitute 1 cup plus 1 tablespoon all-purpose flour. 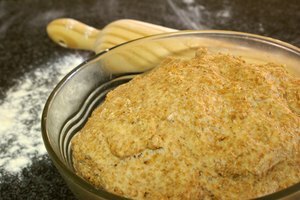 Another option is to mix up a substitute bread flour by combining 1 cup all-purpose flour and 1 tablespoon wheat gluten. Use an equal amount of this substitute flour as the amount of bread flour called for in the recipe—if the recipe requires 1 cup of bread flour, use 1 cup of the substitute flour. 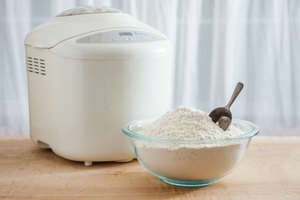 If the wheat gluten still doesn't produce a dense enough bread, add all-purpose wheat flour to create a grainier flour base. Mix 1/2 cup all-purpose wheat flour with 1/2 cup all-purpose white flour, and add 1 tablespoon wheat gluten. Play around with different combinations of flour, and either use 1 tablespoon of the mixture per cup used or add 1 tablespoon of wheat gluten per cup used to create your own substitution.